From the 5th September 2016 all Garda vetting applications for the Football Association of Ireland (the ‘FAI’) will be processed online. 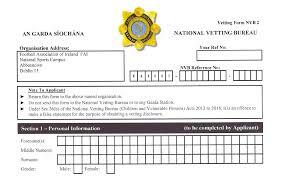 From this date, a new ‘Vetting Invitation Form’ will replace the current Garda vetting form. This should be completed and posted to the FAI, along with the current Garda ID Validation form. On receipt of a ‘Vetting Invitation Form’ and ‘Garda ID Validation form’ the applicant will be emailed an invitation to complete the Garda vetting process online. These forms, as well as guidelines for completion will be sent to you on the commencement date to circulate to all affiliated to your National Body or Provincial Association.